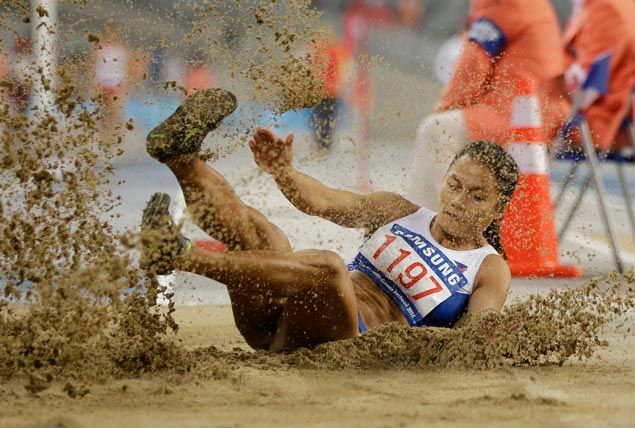 LONG jumper Marestella Torres-Sunang has regained her ticket to Rio de Janeiro after shattering the Olympic standard in the Kazakhstan Open athletics championship. Reports said Torres-Sunang leaped to a new national record of 6.72 meters in the women’s long jump on Monday, just under the 6.70-meter Olympic standard for the Rio Games. Once official, Torres-Sunang will book her third straight trip to the Olympics, but this time on her own merit. It also comes just a few weeks after losing her berth in Rio to Mary Joy Tabal. Torres-Sunang was originally slated to go to the Olympics through a universality place, given by the International Olympic Committee to a country that only has one qualified bet for the Games. She was all set to join 400m hurdler qualifier Eric Cray in the Philippine contingent until Mary Joy Tabal broke the Olympic standard in women’s marathon in an event in Canada. The 35-year-old's stint the Kazakhstan was her last chance at making it to Rio since the cutoff date to hit the standard was on July 11.